Go Back GMTS - My leadership journey. In the third of our GMTS guest blogs, Paul Fleming talks about his personal experience and learnings from under taking the GMTS program. Hello my name is Paul Fleming. Looking back on my time in the NHS Graduate Management Training Scheme I have been able to reflect on my leadership journey over the last few years. I am hoping to share with you the key take homes I have learnt throughout my exposure to leadership. All views are my own and thank you for taking the time to read this. 1. Leadership is not measured in time served. Leadership in many forms. When I first began my leadership journey it was evident to me that many only see leaders as those with the most experience within an organisation. This is fundamentally flawed as leadership comes in many forms. Although there is obvious benefit being both a leader and an expert this is not always possible. When you are beginning your journey it is possible to demonstrate leadership through your actions and behaviours. Start by leading with your behaviours, by embodying the behaviours you wish to see in others. Once you have gained more experience lead with your actions and make decisions, being cognisant to bring all those within the team with you through change. A mentor once told me that “If my team is not delivering look at me first”. This highlights to me the real importance of a leader and the weight leadership carries. It also leads me to question how I ensure throughout my leadership journey that I demonstrate positive leadership practises. Within my journey I have picked up the following key indicators of good leadership; Tools, Training, Time, Support, Feedback, Clarity and Direction. 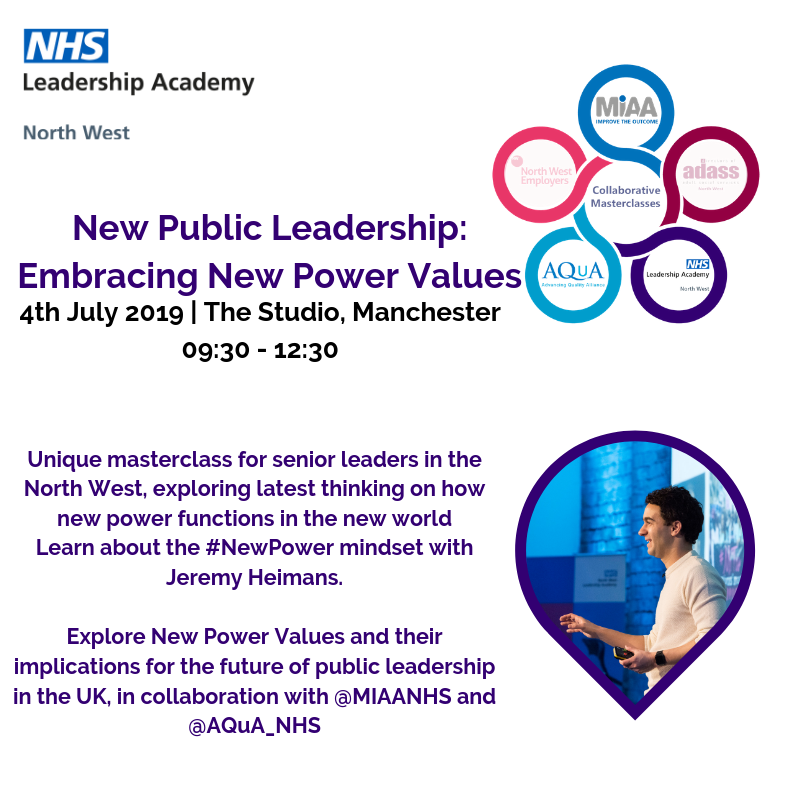 In demonstrating these qualities myself and witnessing these in others I have been able to make change and influence others without formal line management responsibilities, to serve transformation within the NHS. I believe that using these with all those around you and assessing yourself based on these will undoubtedly lead to improvements within your leadership practices. 3. Give yourself time before you start to lead – there is benefit to See, Do, Teach. In observing leaders I have noted that those who succeed are those who don’t make decisions without first analysing the culture and practices of an organisation. I was once told to “Survive then Thrive” and I stand by this. Focus your time initially on understanding those around you, the power dynamics of an organisation and the current practices they undertake. Once you have a sound understanding of these and you are proficient and respected within your role suggest improvements and make changes. This reminds me of the phrase “rock the boat but stay in it” as change best occurs when you have the support of those already within the system. 4. Document your learning and “nuggets of good practice”. I have always been keen on keeping a reflective log of my experiences, learning and exposure to best practice. This helps me to not only emulate the actions of other leaders but also provides me a comprehensive list of opportunities that I can draw knowledge from when starting in a new positon. A good few examples of these are NHS Right Care for commissioners and Model Hospital for providers. 5. Leadership growth - being a mentor and a mentee. A key theme throughout my leadership journey has been mentorship. I have been blessed by those around me offering mentorship and I have passed this forward by beginning mentorship myself. I recommend finding mentors to anyone I talk about leadership with. Find someone that inspires you and spend time with them. This is not always easy as everyone is extremely busy in the health and care sector but the returns are worth your investment in time. Counteract those in your life that act as “Drains” (people that drain your energy) with those who are your “Radiators” (those that provide you energy and encouragement). This has helped me many times retain my passion for healthcare when you have instances of self doubt or disenfranchisement. 6. Your leadership journey doesn’t and shouldn’t end. I believe it is everyone’s obligation to keep reviewing their leadership practices and how you impact on those around you. Being a leader in healthcare is difficult at times but it is worth it. The work I do makes real impact on patient’s experiences of services and facilitates the amazing work of colleagues around me. I make a note to review how I am leading change on a monthly basis and provide myself some time to reflect on my experiences and my continued motivation.